When ideologies clash, there are sure to be fireworks. And that is exactly what happens when the greats of Amitabh Bachchan, Shah Rukh Khan and Aditya Chopra come together to create a masterpiece. A love saga that continues even after death. A story that tells us that love is indeed the greater force than fear. 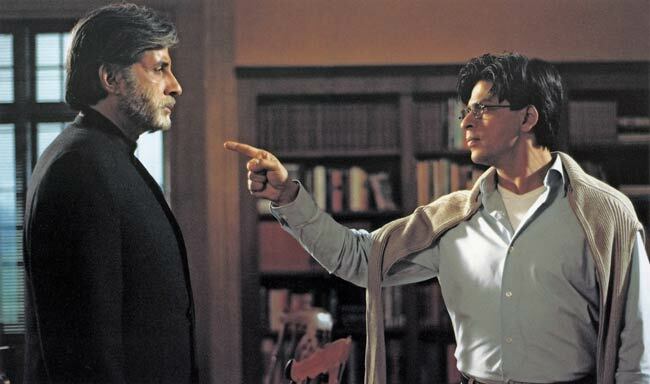 Mohabbatein is indeed a love story that lives on forever. Mohabbatein is a 2000 Indian musical romantic drama film directed by Aditya Chopra. The film stars Amitabh Bachchan and Shah Rukh Khan in pivotal roles, along with six young debutantes. Aishwarya Rai appeared in flashbacks as Khan’s lover.It was Chopra’s second directorial venture after Dilwale Dulhania Le Jayenge and was filmed at India and the United Kingdom. The film is notable for being the first time that Bachchan and Khan appeared on-screen together. The story revolves around two stubborn men with opposing beliefs battle each other – three love stories are at stake. Shah Rukh Khan portrays Raj Aryan Malhotra, a man who has everything taken away from him suddenly because of his forbidden love. His education, his future and even his love is snatched from him. And yet he survives. Survives to spread the message of love. He comes back to his alma mater, the place responsible for his downfall, and strives to still preach the importance of love. Against him is Narayan Shanker, played by Amitabh Bachchan, a man whose hatred towards love has gotten even stronger over the years by is daughter’s untimely death. Love and hate clash like never before. And it cannot be more beautifully shown, thanks to the genius of Aditya Chopra. The film went on to do well both critically and commercially. It also won several awards including the Filmfare Critics Award for Best Actor and the Filmfare Award for Best Supporting Actor, for Khan and Bachchan respectively.